In the loving plans of Divine Providence, the way for Don Bosco's triumphant entry into Burma – the "Golden Land of Pagodas" – was already cleared and prepared. A certainly saintly old priest, Rev. Fr. Leo Lafon of the French Foreign Missions, had already built a beautiful cathedral like church and a big Catholic Chinese Orphanage in the heart of Mandalay – then the capital of the Burmese Kings. A flourishing Chinese Catholic community was already in existence. One thought kept gnawing at the heart and gave the old man no peace: "What's to become of this wonderful lone venture of his in the very throbbing, – life – center of Burma, his chosen second mother land!" His one ardent wish was that his work continues down through the ages long after he was dead and gone. He had put his heart and soul into it: he had lavished his all on it: he would in the war years lay down his very life here! To this day the sacred remains of this revered Priest lie in the crypt under the main altar of the St. Joseph's Church. And the famous school – even to this day after the nationalization – is reverently called: "Lafon Memorial School." Right back it was in 1927 (that good Fr. Lafon, inspired by Our Lady, wrote to Rev. Fr. Mathais – later archbishop and an outstanding apostle of Salesian South India – the provincial of the Salesians in India. He did not want his beloved project to die off. It was an unconditional offer of his entire work into the hands of the Salesians. Divine Providence had opened up Burma to Don Bosco! Ver Rev. Fr. Ricaldone, the Rector Major, appraised of this good news immediately promised to send over the Salesians as soon as he possibly could. And from that day on the boys daily stormed heaven with a fervent Our Father, Hail Mary, and Glory be in hounour of Don Bosco to speed the Salesian arrival. But some ten years were to lapse before anything could materialize. In 1937 very Rev. Fr. Candela – the Catechist General of the Salesians, paid a visit to India. With Msgr. Scuderi, the Provincial of Calcutta, he made a quick trip to Burma. They were honoured guests at the residence of Bishop Albert Faliere and spent a few days in Mandalay. All the final arrangements were made for the official handing over of the School and Orphanage of Rev. Fr. Lafon. Not till January 1939 – two full years later – did the crowd start moving. Rev. Fr. U. Bording, Clerics Anthony Del Col, and Denis cavanah, and Coadjutors Charles Del'Acqua and Angelo Bongiorno were given their formal obedience to staff the new House in Burma. Rev. Fr. Anthony Alessi was to be the first Rector of the new foundation. They left for Burma on the 24 January 1939 and on the Feast of St. John Bosco the solemn ceremony took place of the handing over by Rev. Fr. Lafon in the course of a beautiful Garden party. Overwork and stain took their toll in the very first months. Bro. Bongiorno took seriously ill; Bro, Denis Cavanagh contracted tuberculosis. By the April of 1940 both had to leave for India. New blood poured in, in the persons of Bro. Staro and Bro. Joseph Krammer, who took charge of the Carpentry. In February Rev. Fr. Barattoni and Bro. Giacomin came over; and again, in April Rev. Bro. Bertollino came over to replace Bro. Del Col who returned to India for his theological studies. With the entry of Italy into War in the June of 1940 all the four new Italian Confreres were under strict surveillance and were finally packed off to India by boat to the Internment Camp at Dohra Dum where they remained for the entire space of the war years. The remaining confreres with Rev. Fr. Alessi went through very harrowing times during the war years. Most of the boarders were sent home, and they themselves had to leave Lafon and take shelter on the outskirts of the town at the Protestant Leper Asylum till 1945. Soon after the war in October, 1945 Rev. Frs. O'Brien and William Cole (this latter for a short stay only) came to help in Burma. The interned Salesians too returned from India and the Mandalay House was brought up to full strength. In November 1946 Rev. Msgr. Mathias, Archbishop of Madras visited Burma and after a thorough study of the situation decided that it was imperative for the Confreres and boys to have a Rest House up in the hills of May Myo. The following March Rev. Fr. Alessi made a trip to Anisakan and arranged to buy up the beautiful scenic plot of Mr. Keanander. Burma gained its rightful independence from the British on that beautiful and unforgetable day – 4, January, 1948. It was a day of great rejoicing and gratitude to God. In the post-war years Rev. Fr. Alessi had continued to send yearly three or four aspirants to India for further training. Two of them – Victor Sein Nyunt (now Bro. Victor Zeya) and Francis Tin Maung had been sent even before the war in May, 1941. They were now ready to return to Burma as clerics. Towards the close of 1948 Rev. Bro. Silvio Vitali was sent along from India to join the Salesians in Burma. But things took a turn for the worse in Burma for in January 1949 the Karen revolted against the Government. Mandalay and May Myo were quickly overrun by these rebels, and our Karen lads happily joined them. The schools had just closed. In the confusion of the fighting the Government forces bombed the Lafon School and we lost one of our boys, Fr. Alessi himself narrowly escaped death! The rest of the boys were sent up for safety to our newly acquired Summer Resort at Anisakan. On the 24, April the Government troops finally recaptured both Mandalay and Maymyo. Only after all this turmoil was Bro. Vitali was able to come to Mandalay – he had been stranded in Rangoon for over two months. Joy and sadness seem to walk hand in hand. May 1949 was great indeed, as we welcome to Salesian Burma our first Burmese cleric, Bro. Francis Tin Maung. And very sad was that day in June when Rev. Fr. Alessi returned to Italy, for a very well-earned rest indeed – but he was not to return to us, he was recalled to India; but we take pride that he later became Provincial and that three times in succession too! 1952 also saw a number of departures and arrivals. Rev. Fr. O'Brien and Bro. Victor Sein Nyunt arrived from India. Rev. Fr. U. Bordin went down to look for a suitable place in Rangoon. A new building was started for a workshop and a concert Hall in January, 1953. In May, 1954 St. Joseph's Parish of Thingangyun, Rangoon was officially given over to the Salesians and we started a School there. Great celebrations at Lafon – Rev. Fr. Thomas D'Sousa our very first vocation from Burma was ordained a Priest on 17 December 1955. Another Red letter day, the new Rector, Rev. Fr. William Balocco after having taken over in October, 1952, had the solemn opening of our new Aspirantate at Anisakan, Maymyo on the 19, March, 1957, feast of St. Joseph. Another great step forward was taken in this same year with the opening of the Girls' school, started with a few Catholic Teachers. Later in January, 1961 five Salesian Sisters arrived in Mandalay to take up the running of this Girls' school. Things began to take shape with our Aspirant increasing in numbers. In April 1964 there was the opening of our First Novitiate, In the following year 28 April twelve Novices took their first vows at Anisakan. With the permission of our Major Superiors we also began our own Philosophical Courses in May 1965. The following year we sent down our first group of Philosophers and Pre-Novices to Rangoon to join the Major Seminary, Junior Section. And on the 18 March, 1965, Mandalay-Lafons witnessed the colourful Ordination Services of Rev. Fr. Jocelyn Madden, SDB. On the same Day in Italy Rev. fr. Lawrence Khin Sein was also ordained. Salesian Burma suffered a tremendous blow when on 1 April, 1965 all Mission Schools were nationalized and among them were our two flourishing ones – Don Bosco's, Thingangyun (Rangoon) and Lafon Memorial School (Mandalay). It was the death blow to our Educational facet of our Salesian life. But it turned out to be truly a blessing in disguise. We were later to experience it in the marvelous expansion of our missionary efforts in the Salesian Prefecture of Lashio that the Holy See entrusted to us in 1976. A further blow that we felt very deeply was that all our foreign Salesian Missionaries (except 2) were expelled in November 1966. Lack of personnel forced us to close down the House attached to the Major Seminary in Rangoon. The situation became critical and the Superiors from Rome decided that the Aspirantate be closed for the present. The remaining Confreres were given the option of either waiting with us or of joining the Major Seminary and going ahead for the Diocesan priesthood. There was one year of Novitiate (1969-70) for those who still remained with us. But later everything returned to normal and we continued with our Formation Houses and programmes. Meanwhile, Divine Providence was slowly preparing the ground for the Sons of Don Bosco to take over the Missions in the Northern Shan State. Three new Priests swelled our ranks – Rev. Fr. Malcolm Ambrose and Rev. Fr. Paul Tin Maung on 10 December 1972 ordained at Mandalay, and Rev. Fr. Lucius Dau Hawng on 24 December 1972 at Namtu. The Parish of Namtu in the Northern Shan State was offered to the Salesians and Rev. Fr. Jocelyn was appointed as Parish Priest. Two years later – 10 February 1974, three more priests (Fr. Maurice Vallence, Joachim Ye Maung and Fr. Victor Bernard) were ordained and added to the list of the Missionaries. A serious setback occurred for us with the defection of one of our Confreres, Rev. Fr. Ah Kee, and on the 31 October of the same year the Archdiocese of Mandalay requested us to withdraw from Lafons and from the Archdiocese of Mandalay. More sad news – just a few months later – on 6 January 1975 – a concerted action of the bishops it seemed – we were asked to return the Parish of st. Joseph's Thingangyun, Rangoon. But marvelous are are the ways of Divine Providence! We were immediately invited to start a new Mission in Kyaukme, Northern Shan State, and Re Fr. Cyril Francis (of Thingangyun, Rangoon) and Rev. Fr. Victor Bernard (of Mandalay) began the new Mission of Kyaukme on the Feast of St. John Bosco – 31 January, 1975. Fr. Edwin was ordained on 18 April 1975 and was appointed in Lashio to help Fr. Calvani. The Holy See was working fast and soon on the 9 April, 1976 arrangements were made and the Decree from Rome arrived for the erection of the new Prefecture of Lashio, Northern Shan State, the entrusting of the it to the Salesian Congregation, and the Installation of Msgr. Jocelyn Madden, SDB as the first Prefect Apostolic. On the same day we were blessed with the Sacerdotal ordination of two more Salesian Priests Rev. Fr. Charles Bo, and Rev. Fr. Edward Sein Myint. With the approval of the Major Superiors the Novitiate was again reopened. And in 1982 as further progress was made clear-cut arrangements had be made and proper procedures for the separation of the Prefecture of Lashio and the Salesian Congregation. Rev. Fr. Joachim Ye Maung was appointed as our first Provincial Delegate of the Salesian Province of Calcutta. He was at the same time holding the office of Novice Master. Rev. Msgr. Jocelyn in December, 1985 asked to be relieved of his office and Rev. Fr. Charles Bo took over as interim Apostolic Administrator. Later in June 1986 he was officially designated as the new Prefect Apostolic. But the solemn investiture and installation actually took place only on 2 November 1986 at the hands of the Metropolitan Rt. Rev Msgr. Alphonse U Than Aung, Archbishop of Mandalay. During these past few years the Prefecture has had five Diocesan Priests and on 6, April, 1986 we had three more Salesian Priests ordained at Maymyo – Rev. Fr. Basil Khin Maung Latt, Francis Dass and Gabriel Myit Aung. The entire Prefecture of Lashio is entrusted to the care of a Salesian Prefect Apostolic, twelve Salesian Priests, five Secular Priests, two Salesian Coadjutors, Forty-three Sisters, and some fifty Catechists. There are ten Mission Stations with Lashio as the Centre. We number some 18,000 Catholics in a total population of 2,000,000. Our Christians are mainly from the three Hill tribes – Kachin, Lisu and Wa. Lashio was originally one with the Diocese of Kengtung and everything was directed from that far off centre. In those days, communication was no problem and the various jungle routes were possible, and restrictions were few even for that group of foreigners – the Italian PIME Fathers (Foreign Missions of Milan). Mission life and work was hard, pioneering work, but very exciting, challenging and fulfilling. Thanks to the daring, tireless and self-sacrificing work and zealous labours of those intrepid Missionaries, the Lashio area was pretty well developed and Churches, Boardings, and Christian communities were established and flourished everywhere. Active and friendly – these Fathers had for long years been in contact with the Salesian Fathers – mostly Italian in those days – from Mandalay. That was the reason we Salesians had the choice falling to us rather than to any other individuals or groups of Priests. Besides – congregation wise – we were the only ones fitted and qualified to step into the gap created by their departure. In course of time things changed somewhat – rebel activities kept increasing. The previous jungle routes became dangerous and eventually closed altogether. The situation kept worsening and the movements of the Fathers were steadily restricted, till finally mission work and touring in the villages was almost a write off! Permits had to be procured and that too with ever greater difficulty for them to be able to move around in this particularly rebel-infested and border area. To compound these problems many had died and most of the remaining missionaries were well into their sixties! Matters slowly grew to a head. Life was becoming difficult and impossible and impracticable. The only course of action in such a predicament was to conserve what dwindling forces they still had and to consolidate themselves in their mother Diocese of Kengtung. So the Holy See was approached: the Major Superiors were consulted, and arrangements were made for a switch over. 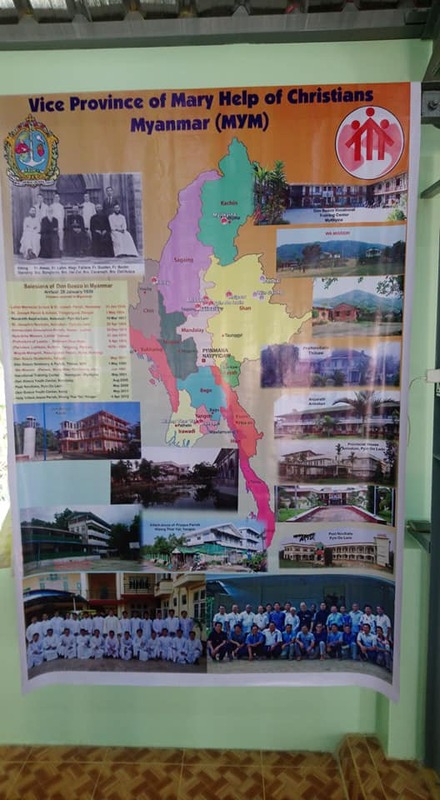 The Holy See formally invited and eventually entrusted this porting to the Salesian Congregation – erecting it into a new Prefecture Apostolic of Lashio. Rev. Fr. Joseph Ah Kee, SDB, the Provincial Delegate of the Salesians Began to help out gradually. At Namtu in the Northern Shan States; Rev. Fr. Lucius Dau Hawng, our only Kachin Salesian priest was ordained on the 24, December 1972 and stayed on to help in Namtu. Later on, still Rev. Fr. Paul Tin Maung was posted in Namtu. Rev. Fr. Jocelyn too went to help out for some time. As help was need in Kutkai Rev. Fr. Joachim Ye Maung did a spell up there. Rev. Fr. Maurice and Fr. Edwin D'Silva went to help out Rev. Fr. Calvani at the Lashio Centre. Rev. Fr. Joycelyn then became the Provincial Delegate in 1974. The following year on 20 January 1975 Rev. Fr. Cyril Francis and Fr. Victor Bernard opened up the Kyaukme Mission. Rev. Fr. Edwin was ordained in Mandalay on 18 April 1975 and was again put in Lashio to help Rev. Fr. Calvani. Finally the great day came – 9 April, 1976. The Holy See formally entrusted this newly erected Prefecture Apostolic of Lashio to the care of the Salesians in Burma. Msgr. Jocelyn Madden, SDB became the first Apostolic Prefect. Soon after the departure of Rev. Fr. Calvani for Taunggyi, Rev, Fr. Edwin was recalled to help in Lashio. Rev. Fr. Maurice was posted to Anisakan as Rector. Rev. Fr. Edward Sein Myint helped out for over a year in Lashio. He was succeeded by Rev. Fr. Maurice, who became Parish Priest and procurator for the Prefecture up to this day. - The opening of the Diocesan Minor Seminary at Lashio Gyi with 25 boys. This Parish of Immaculate Conception of Namtu was frist founded by the Fathers of the Foreign Mission of Paris (MEP) in about 1870. Later it was entrusted to the Fathers of Foreign Missions of Milan (PIME) around the year 1927. It was finally handed over to the Salesains on 28 January 1973. Rev. Fr. Jocelyn and Fr. Lucius were present to take over from the Rt. Rev. Msgr. Abraham Than, Bishop of Kengtung. In 1977, Rev. Fr. Cyril Francis took up the Parish, which also catered for the Pangmaichyung area (Namsan) about 30 miles west of Namtu/Bawdwin. The Reparation sisters have a strong establishment at Namtu and also four other Sisters working at Pangmaichyun in the heart of the Lisu Mission. In 1981 Rev. Fr. Victor Bernard succeeded as parish Priest, with Rev. Fr. Edwin as his Assistant and Clerics Bro. Basil and Michael. At present Fr. Victor runs the area with a Coadjutor Bro. Anthony Mg Sein, 6 sisters and 3 catechists to help him in the evangelisation work. The Mission is rather extensive and till recently ti also included the Pangmaichyung Lisu area (Namsan). Right now in Namtu there are only the Kachin villages and the town area to look after. There are three Boardings: two for the girls run by the Reparation Sisters with 50 children each; and a Boys' Boarding with 30 boys at Namtu run the Salesians. Namtu is a mining, industrial town depending on its Sister-Town Bawdwin, where the mines are located. The population is about 30000; and as all mining towns is a hot pot of many areas. The Catholic population of the entire area with its 27 surrounding villages is about 1500. Catholic life in the villages has its difficulties as every rebel-infested area poses. Frequent skirmishes with Government troops and the consequent damages, disruption and punitive measures, make life rather difficult. Town life is more stable and work there is on a more organized and regular style. Church attendance is good, and apostolate is flourishing with the aid of various lay Apostolate Groups and particularly the Legion of Mary. The parish with its large and beautiful Church of the Immaculate Conception was first begun by the PIME Fathers, Rev. Fr. L. Giufrida and Fr. E. Abbiatti in 1954. In 1977 the Salesians took over and Rev. Fr. Paul Tin Maung was installed as our first Parish Priest. Rev. Fr. Jocelyn and Rev. Fr. Joachim Ye Maung continued the work for a couple of years. Rev. Fr. Paul later took up the reins again. The mission Centre is a well spread out 35-acre plot with the Church, the Priest's residence and the Boys' Boarding on one side, and the Convent and Girls' Boarding on the other. There is also an extensive area for cultivation attached to this residential area inclusive of a couple of large fish ponds. Here too the Fathers and the Sisters have one Boarding School each with about 100 children in all. There are about five sisters working with the Parish Priest, and helping to look after the children and going on tours. The mission area is large with about 150 villages in about 5 townships. In a total of about 200,000 there are about 5500 Catholics. Some 19 Catechists scattered all over the villages help the missionary to evangelize this area. In 1975 Kutkai was the venue for the Grand Centenary Celebrations of the Salesian Missionary Expedition. It was held on the Feast of St. John Bosco – 31 January. It was a tremendous success and was well attended. Again in 1983 two of our Kachin priests, natives of this particular area, were ordained in grand style. The Bishop of Myitkyina, Rt. Rev. Msgr. Paul Grawng, himself a Kachin, very graciously accepted our invitation to ordain our two Deacons – Luigi Lum Dau and Paul Zau Sam. Yearly Catechist Get-Together and the annual Youth Camp are a regular and enthusiastic feature of the Mission. For a more convenient apostolic care and administration, Rev. Fr. Paul Tin Maung looks after the town and the larger portion of the surrounding area, and Rev. Fr. Edwin takes care of the Muse/Namkhan area to the north towards the China border. As is usual in all our Lashio mission areas there is an element of risk and fairly frequent disturbances on the part of the rebels and of our own Government forces. Our mission labours and tours are never entirely smooth affairs. The mission Church is dedicated to St. Joseph, the worker. 7 January 1975 – a great day for us Salesians as we entered yet one more area of our future Prefecture of Lashio. Fr. Jocelyn and Fr. Lucius together with our Catechist Louis Ba Aye, went up to Pangpau – 55 miles northwest of Kyaukme. There in a beautiful ceremony they took over from Rev. Fr. Philip Ze Hawng of the Bhamo/Myitkyina Diocese. The Mission Parish was formerly run by the Priests of the Foreign Missions of the Parish (MEP). In 1976 Rev. Fr. Victor Bernard, from Kyaukme, was sent up to learn the language and remained on as the new Parish Priest. He picked up Kachin well and it has helped a great deal in his subsequent apostolate in various other missions. On 28, July of the same year Re. Bro. Victor Zeya, our Salesian Coadjutor Brother was sent up to make up the community of two. The following year some four sisters of St. Joseph of the Apparitions came to settle and work in this area. In 1979 a grand ordination service was held in Pangpau for a diocesan priest, Rev. Fr. Donald Hkawng Lum, a native of this central village. It went off with great pomp and show and Christians and pagan friends from near and far – as far up as Kyaukme and Lashio – partook of this joyful feast. For the occasion a special request was made both to the Government forces and to the Rebels to respect our religious Feast and to refrain from any hostilities during this whole period. The Golden Jubilee of the Catholic Faith was also celebrated here in 1981 with full participation of all the Christians from all over. Rev. Fr. Lucius succeeded Fr. Victor in 1981 and has been up there till date – the pastor-in-charge. Parish of the Sacred Heart. It is situated some 7 miles from Namsan. A very cold, wind swept some 7 right up in the heart of the Lisu area. This is the centre for the Lisu Tribe that entered the Church just 30 years ago. Prior to the Salesian take-over – or better still, the pioneer Missionary here was Rev. Fr. G. Bentoglio of the PIME Fathers, who began sometime about 1960. He was very active and built a fine Church, Clergy house, and a Convent there. He had a group of Sisters of Divine Providence helping him. There was already a very good group of Lisu Christians in quite a number of villages. From 1975 on beginning with and the longest was Fr. Cyril Francis, there was a long succession of Salesian Priests who took care of this Parish with all its scattered villages. Rev. Fr. Victor Bernard looked after it for a year and a half (1985) from Namtu. At Present there is a convent of the Reparation Sisters with four Sisters looking after a boarding with 30 children. These Christians are converts from the Animists and are a rather slow, backward race, originating from China. They have a writing of their own in Roman script with quite a number of the alphabets written upside down. Not many can read and write. They subsist on mountain cultivation and a bit of Tea-gardening. A great event in this Mission Station was the sacerdotal ordination service of their first and only Lisu Priest – Rev. Fr. Francis Athapha. It was a great occasion of Christian witness to all the neighbouring villages. For the festivities all the Christians from the different villages came in a show of strength to participate. Rev. Fr. Delegate from Anisakan came up with all the Salesian Novices and Brothers and spent a few days. A good number of Sisters, Boarders (boys and girls) and some catholics from Namtu went up for the Feast. In 1986 – this year – with the reshuffling, Rev. Fr. Francis Athapha is now posted to Pangmaichyung as the resident Parish Priest. There are 3 catechists and four sisters helping him to look after 730 catholics spread out in 17 villages. Long before the Salesians the PIME Fathers had developed this particular Mission area. The Christian community is strong and the number of Catechists are many. The mission centre at Loikham is a very imposing complex of buildings with the Church in the centre and the Priest's residence, the boys' Boarding, and the Sisters' convent with the Girls' Boarding. It is a real beauty spot – a little jewel set in the jungle! One comes through winding, thick jungle routes and then suddenly happens upon this beautiful scene – the whole building complex is an eye-catching one! There is a lot of real mission touring in this vast area. The priest, sisters, and eight catechists have a full time seeing to the needs of about 2500 Christians spread out in about 56 villages. Many priests passed through since the takeover by the Salesians in 1976. But the one that really gave a tremendous push to the work was Rev. Fr. Charles Bo (now our new Prefect Apostolic). He not only mastered the difficult Maru language well, but also organized the Catechists and missionary work. The Catholics there are all Kachins. And between the two Boarding houses (Father's and Sisters') there are about 100 boarders. Here too the touring and mission work is badly hampered by the difficult and delicate political situation. Most of the rebels are from the among the very Christians (Protestants) and Catholic Kachins for whom we are working! That makes things rather sensitive when having to deal with the Government and army on behalf of our people! The present Parish Priest is a son of the soil – Rev. Fr. Paul Zau Sam, who was ordained on 9 April 1983 at Kutkai. The present Tangyan Mission and town was previously only a stop-over on the way to Manphan, the capital of the Wa States, and the heart of the Wa Mission area. Now in the existing political situation, all that vast area on the other and farther side of the Salween River is now lost to us – in communist hands entirely! No open missionary work can be carried on there. No missionary is allowed – nor is it safe – to venture over there on the opposite banks of the Salween! There is only clandestine work and "underground" church activities possible and that has been carried on all these years! And to think of it! – once, exactly over there. There had been a really flourishing Catholic Mission there at the time of the Italian PIME Fathers! After the Italian Fathers left – we Salesians also were too short of personnel to be able to stretch ourselves out so far – as Tangyan is right far out to the eastern border of our Lashio Prefecture on the China border! Rev. Fr. Lucius from Loikham (1978) was looking after that area as well. But a year later Rev. Fr. Lucius and Bro. Victor Zeya were sent to reside there and to cater for the whole Mission area. In 1980 Rev. Fr. Edwin was transferred there and the mission work continued vigorously. There was a fine Boarding for the Wa boys at Tangyan with about 40 boys. Later Lashio catered for it sending the priest occasionally – Fr. Thomas Zam Kham, a Wa. Being the only Wa national among the Priests of our Prefecture, he has to move around and see to all the other Wa speaking areas. At present he is trying to do something for the Wa literature. There was an appeal to Rev. Bro. Alphonse a Xaverian Brother, to come over to assist in implementing the Wa literature with Rev. Fr. Thomas, but did not work out. Also the Sisters of st. Aloysius were there about two years and more. But for some reasons of their own they were unable to stay on.